A Word a Week Challenge: Decadent | Oh, the Places We See . . .
← What’s so great about the Great Wall? When I saw that the topic for Sue Llewellyn’s A Word a Week Challenge was the word Decadent, I couldn’t help but take a break from posting about China to switch over to Russia. 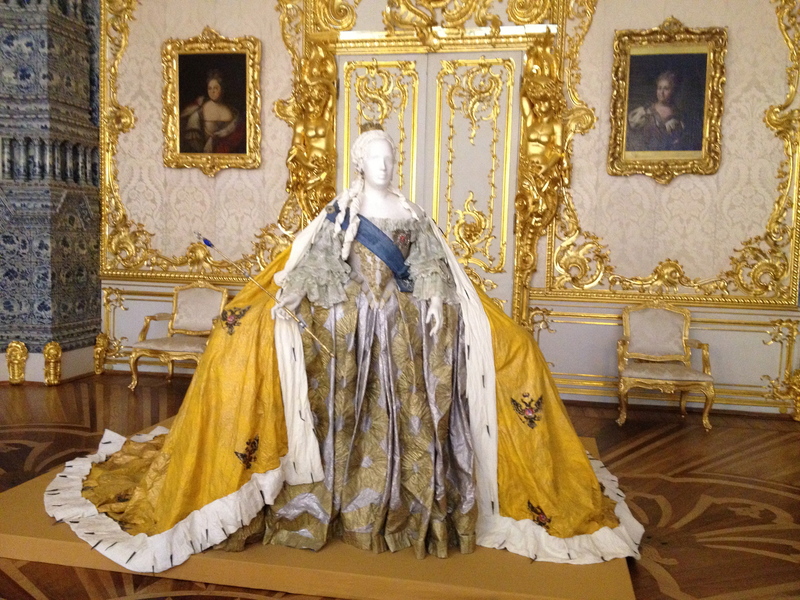 One of the most decadent places we visited on our Viking River Cruise: Waterways of the Tsars from Moscow to St. Petersburg was the Catherine Palace at the Tsarskoye Selo State Museum-Preserve. As we moved from room to room with a crowd of (just like us) tourists leaning, peering, and picture-snapping, we couldn’t help but marvel at the acquisitions and ornamentation that made each room more spectacular than the last. With clean white walls and gold trim, the mirrored room held us captive. But subsequent rooms showed off statuary, table settings, and period pieces the likes of which we had never seen before. Here’s just a small sample. 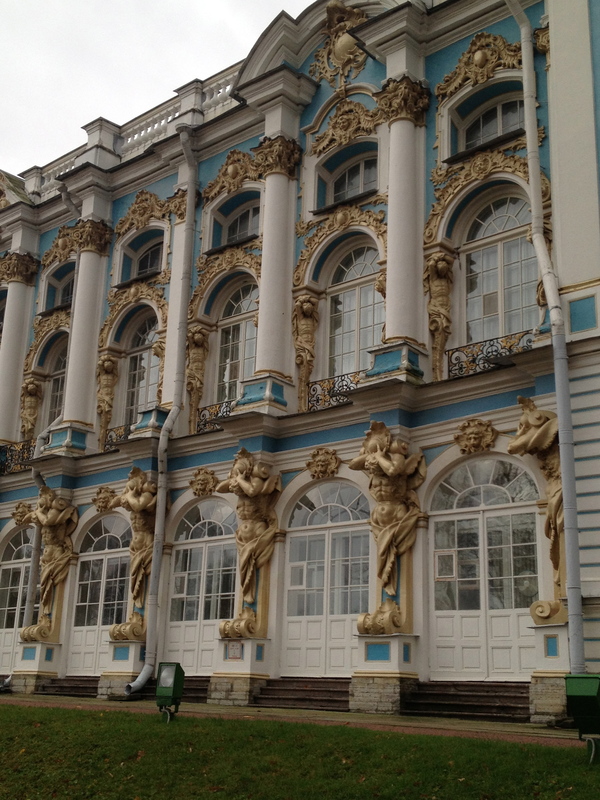 The decadent exterior of Catherine Palace near St. Petersburg. Note the statues of Atlas holding up the world at each section of this exterior wall. One of the white-walled rooms adorned with gold. Fireplaces made with Delft tiles stood sentinel-like in various rooms — sometimes in corners or centered like this one. Opulence was under foot, too, in the form of exquisite parquet floors. Just one of many artifacts of decadent clothing on display. 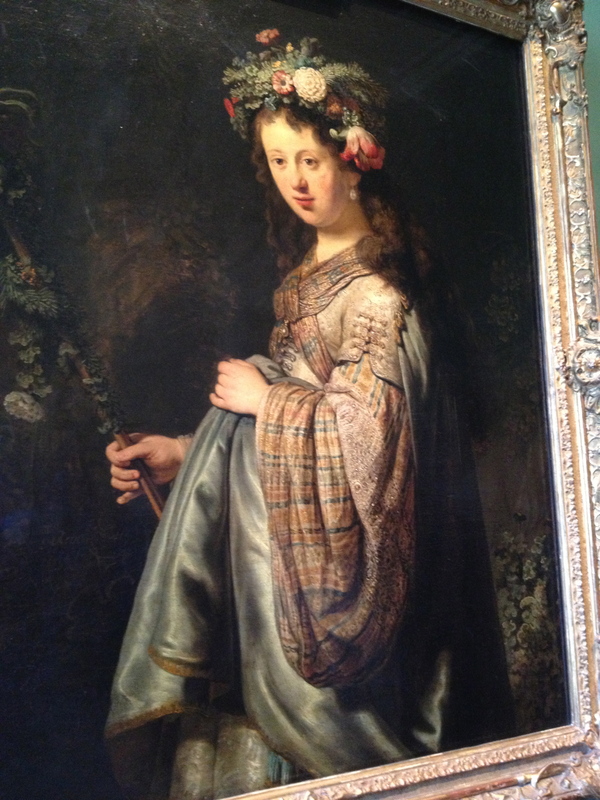 Even the artwork featured people in exquisite attire. This entry was posted in A Word a Week Challenge, Museum, Russia, Travel and tagged Atlas, Catherine Palace, opulent, Russia, St. Petersburg. Bookmark the permalink. I guess that the cruise must have been great. We love to cruise and make them every now and them. Last year we made a cruise from our home town to Rock Paintings on the lake. We’ve only been on two cruises, but we’d love to go again. Maybe next year! We loved this place. My photos truly do not do it justice! Each room took our breath away!!! Indeed Decadent 🙂 Thanks for sharing, Rusha! Thank YOU for reading and commenting! Hope your week ahead is a good one! Rusha, I just can’t get over how lavish all of this is and the money it had to take…sigh! Gorgeous no less…great captures. Thanks. We were not expecting to see such extravagance in Russia. But there are fabulous collections there in the museums, palaces, and cathedrals. An amazing place! For us, getting a visa was no trouble at all. We also had to have one to enter China. You send your passport and money and wait. It comes in the mail. 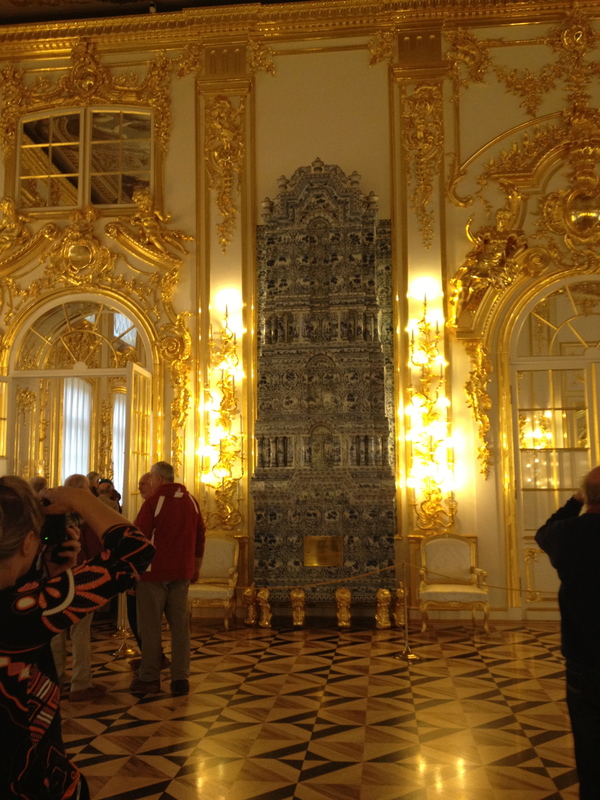 Thanks for noticing the fireplaces in Catherine Palace as something outstanding! They were. But then, the whole place was amazing. We were not expecting such opulence in Russia. 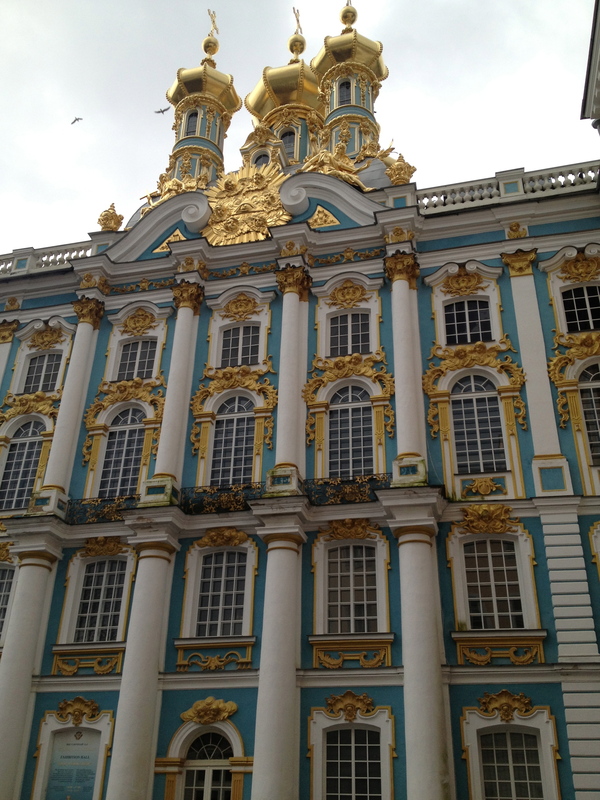 But if you visit St. Petersburg, you’ll see many over-the-top palaces, shopping areas, and cathedrals. WOW!!! We are going in Aug ’14!! This is one great place to see as are the Hermitage and Peterhof. Get ready for some beauty and decadence! That whole place was amazing! But I loved it. Nothing like it around where I live in Tennessee! Thanks for visiting!